On June 30, 2012, the Presbyterian Church USA (PCUSA) will begin its 220th General Assembly. Among other issues, it will tackle proposals from Church committees to divest from three companies that profit from the Israel’s military occupation of Palestine: Caterpillar, Hewlett-Packard, and Motorola Solutions. In the light of intense pressure on the Church to not adopt such a policy, including the usual unfounded accusations, eg the divestment call is ‘one-sided and ill-informed’ and ‘anti-Semitic’— yesterday New Profile (an Israeli feminist organization of Jewish males and females working to counter militarism) sent an urgent plea to the Church. New Profile, an Israeli organization, wishes to express appreciation to PCUSA for contemplating the adoption of a selective divestment policy as a means of bringing peace to Palestinians and Israelis. We fervently support such an endeavor, and hope that PCUSA will indeed adopt it as a non-violent means of ending Israel’s Occupation of Palestinians and their lands, by divesting from three companies that profit from Israel’s occupation of the Palestinians: Caterpillar, Hewlett-Packard, and Motorola Solutions. We wish to assure PCUSA that it is no more anti-Semitic to criticize and oppose Israeli government policies than it was anti-American to oppose the Vietnam war. Indeed, ending the Occupation can only benefit Israelis. For, the Occupation exacts a price from Israelis as well as from Palestinians. In addition to loss of life and increased militarism, Israelis have witnessed these past years a steady devaluation of human life, as is evident from the socio-economic sphere and the affliction of post-traumatic distress. It also seems clear that without outside help, Israel’s Occupation of Palestinians and their lands is unlikely to end. Successive Israeli governments have spent enormous amounts of money on expansion, to the detriment of social benefits for the Israeli population. While it is true that had there been no Occupation, Israeli governments might not have spent the money on social benefits, the fact that expansion continues apace reveals Israel’s intent to prevent the emergence of a Palestinian state and to rid the West Bank of as many Palestinians as possible. To this end, money is spent on maintaining a large military presence in the Occupied Palestinian Territories, on erecting the apartheid wall at 4 million dollars a mile, with 400 miles planned (twice the length had it been built on the ‘green line’), constructing 6,000 more units in highly subsidized settlements (this past year alone, some 12,000 new settlers moved into the West Bank, 4,000 more than were evicted from the Gaza Strip). Much money goes also for constructing super-highways for Israelis-only in the Occupied Territories, as well as for new lookout towers (that can double as sniper towers), and checkpoints galore (mainly separating Palestinian communities). While all this is taking place at considerable economic cost, poverty in Israel has increased sharply. Over ¼ of Israelis now live under the poverty line. A staggering 34.1 percent of them are children. Last year 1 of every 5 children lived under the poverty line; now 1 of every 3 children goes to bed hungry. And every 4th elderly person is poor. No wonder, then, that Israel’s elderly tend to be “suicidal,” as Yedioth Ahronot revealed in a report showing that over 50 percent of suicides in Israel every year are committed by people aged 65 and more. There are additional worrying trends. Not only are the few rich getting richer and the numerous poor getting poorer, but also many in the middle class who have jobs are sliding into poverty due to low wages. One result of the increased poverty is that now 25% of Israelis forego medical care because they cannot afford it. 75% of the poor cannot afford medication. But of all the sad statistics, one of the more shocking is that 60,000 Holocaust survivors now live in desperate straits. It is shameful that of all places in the world, in Israel, Holocaust survivors live in dire poverty and misery. The worsening economic conditions contribute, in turn, to escalation of stress and violence. 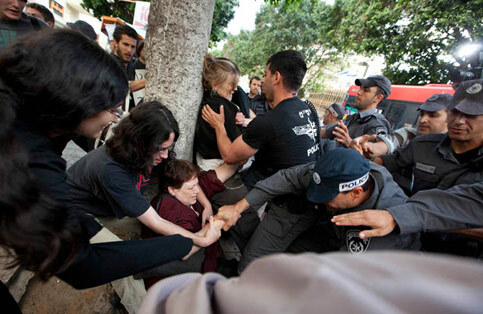 Thus one of every five elderly Israelis is subject to abuse, mainly by spouses or children. Additionally, the Israeli police recorded a 36 percent increase in violence among minors in 2004, a 24% increase in violence among them the first months of 2006, and a 55% increase of violence against children these past 10 years. A direct cost of Occupation and a threat to Israel’s welfare is post-traumatic stress, which can result in addiction to drugs and alcohol, and can also contribute to violence. A rehabilitation center that opened in 2001 with capacity for 25-30 addicts, soon discovered that most of the problems resulted from experiences addicts had while in the military. The center, Kfar Izun, then publicized itself, and was shocked to receive 900 requests for help in the single week following its revelation. I hope that the above data will help PCUSA realize that every non-violent endeavor to end Israel’s Occupation would be a humane act to Israelis as well as to Palestinians. New Profile aims to transform Israel from a highly militaristic society to a civilian society dedicated to equality of gender and ethnicity and firmly based on universal human rights. 1. Its destruction of Palestinian life, society, land, and property. 2. Its role in maintaining militarism in Israel. We therefore seek non-violent means of ending this catastrophic Occupation. One such means is using economic sanctions to pressure the government to change its policy. To this end New Profile welcomes and supports selective divestment aimed at divesting from companies that contribute to the continuation of the Occupation by supplying arms, other equipment, or staff. We welcome all such endeavors, believing firmly that ending the Occupation is not only to the benefit of the Palestinians but also necessary for the welfare of Israel, its youth, and future generations. Over 22,000 Israeli soldiers have died in its wars since 1948. Enough. It is time to beat our swords into ploughshares, to bring security to Israel by giving the Palestinians their freedom and recognizing their absolute right to exist, and to build a future for today’s Israeli youth and generations to come by creating a civilian society whose underpinnings are equality of gender and ethnicity and universal human rights. Dorothy Naor* also notes: It is especially important at this point to write, fax, email, phone the Church to encourage it to divest from companies that help maintain the Occupation. PCUSA contact information is available here. Israeli Jewish group urges U.S. Presbyterians to adopt #BDS resolution — important to know this — some Jewish Israelis support BDS.